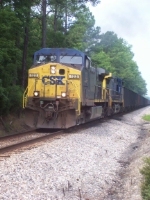 Description: CSX 123 heads up a loaded coal train at Thermal, NC. Description: CSXT 123 is seen powering a EB coal train at Keyser, WV. Description: CSXT 123 is seen at Cumberland, MD. Description: CSXT 123 & 92 are seen on a mty hopper train at Cumberland, MD. Description: Crossing Doswell Rd. a couple of hundred yards west of the diamond. Description: Just easing through Doswell. Description: A westbound coal train, from Elk Run Juction, passing through Bloomingrose, West Virginia. Description: An eastbound coal train is departing Clifton Forge, Virginia. Description: unknown train stopped on the hill with CSXT 123 as the leader. Title: CSX 123 on next to last Tompkins cove coal train. Description: E828 empties from Tompkins Cove power plant. This was the next to last train out of the plant which shut down May of 2008. According to a friend the plant was to run on whatever coal was stockplied and then lights out. Description: After the third unit suffered an air pressure loss at Waycross,and being tied down at Frisco for twenty minutes. CSX grain train G984 is finnaly on the move under humid hazy skies through North Kingsport, southbound overtaking a northbound coal train N4425. Description: CSXT 123 brings Q32730 west in the late afternoon gloom at EE Brighton. Title: CSX 123 and SD40-2 on A746 prepares to set out high wide loads at West Point woodyard. Description: The B236 helper pushes on the rear of eastbound ballast train Q079, as they slog their way towards West End and Tunnelton.